Let’s imagine that there are two main regional divisions in the company: one in the USA, the other in the EU. Each of these divisions has smaller subdivisions. In USA it is the ‘Los Angeles’ division, ‘Dallas’ division, ‘New York’ division. In EU it is the ‘Western Europe’ division and the ‘Eastern Europe’ division. The Sales Director controls both regions. Each of the regions has its own Regional Sales Manager (RSM). Each of the subdivisions has an Area Sales Manager (ASM) who has a team of Sales Representatives as subordinates. We want to configure roles and other access settings in such a way that the sales representatives could access only the data they own. ASMs must be able to access data of the their whole subdivision. RSMs—data of all areas in their region. Sales Director must be able to view all the company data. Let’s assume that we have already created all the required Business Units: ‘Main Office’ (represents the unit that has access to the whole organization), ‘USA,’ ‘EU,’ ‘Los Angeles,’ ‘Dallas,’ ‘New York,’ ‘Western Europe,’ ‘Eastern Europe.’ ‘Main Office’ does not have a parent business unit. Business Units ‘USA’ and ‘EU’ have ‘Main Office’ as a parent business unit. ‘Los Angeles,’ ‘Dallas,’ ‘New York’ have the ‘USA’ business unit as a parent one. ‘Western Europe,’ ‘Eastern Europe’ have ‘EU’ as a parent business unit. Into the ‘Sales Rep’ role we will include permissions that will have the User access level. Into the ‘Area Sales Manager’ role we will include permissions that will have the Business Unit access level. 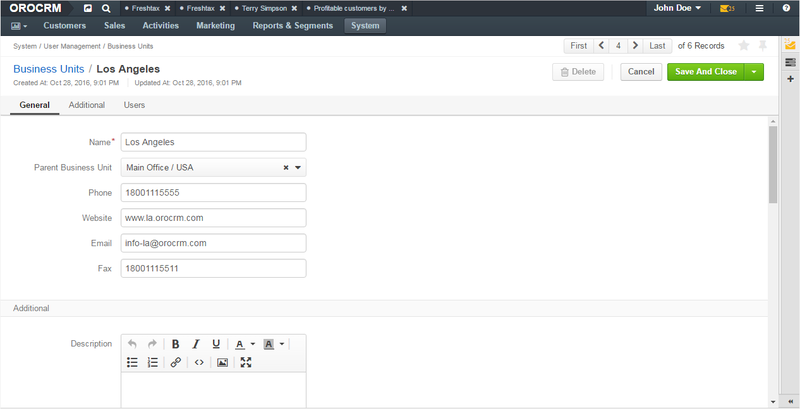 Into ‘Regional Sales Manager’—permissions with the Division access level. And into the ‘Sales Director’ role—permissions with the Organization access level . Second, we configure users: assign roles, define which business units the users will have access to. Owner—The sales director has access to the whole organization. So we set ‘Main Office’ as the owner. Roles—We select the ‘Sales Director’ role. As the sales director will have permissions with the Global access level, there is no need to specify what particular business units they she must have access to. Organization Business Units—Either ‘USA’ or ‘EU.’ Regional Sales Managers will have permissions with the Division access level. A division is a business unit with all the chain of its sub business units and their sub business units an so on. So we need to specify only the top business unit in this chain. Now we can check that when Alan Wise, sales representative in Los Angeles, creates an account, for example, he can assign only himself as an owner of this account (account belongs to him). He will also be able to see only his accounts (unless his managers share any accounts with him). 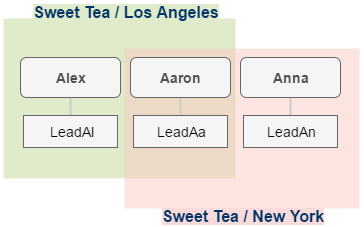 A USA Regional Sales Manager, Samuel Lee, can see and manage accounts of the Nina’s (Los Angeles ASM) business unit and of Anthony’s (Dallas ASM) business units as both of them are subunits of the business unit USA. And, finally, a sales director has access to all accounts of the company. There are two businesses that our company runs. One of them is tea sales. The other one—clothes sales. For each business we have created an individual organization in OroCRM (‘Tea Sweet’ and ‘Best Style’). John, Jane and Jill are marketing team members. John works in ‘Tea Sweet,’’ Jane and Jill—in ‘Best Style.’’ However, being a wide-range specialist, Jill shares her attention between both businesses and thus is given access to both organizations. John, Jane and Jill are assigned the ‘Marketing’ role that includes organization level permissions. This mean that you must be very careful when granting or rejecting users access to organizations. 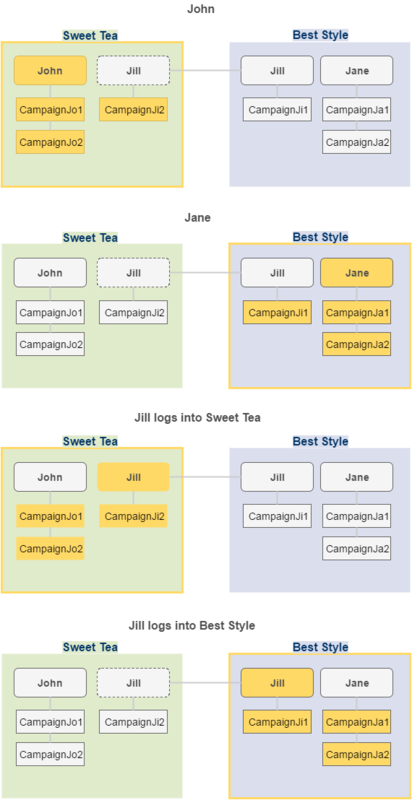 Imagine that John has only user-level permissions for working with campaigns. 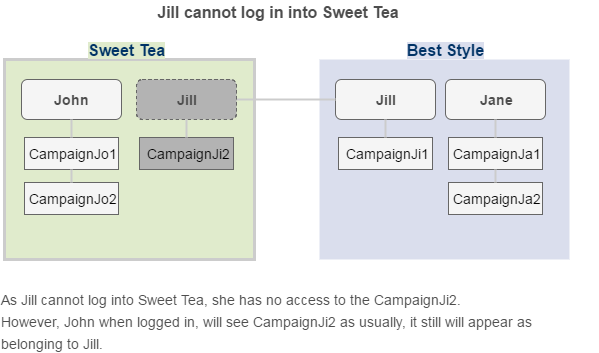 Then there will be no one in Sweet Tea (except maybe a system administrator) who can manage Jill’s account. Such situations are better to be avoided, thus try to make sure that there will be no unattended data when you change access rights. For how role is represented on the interface, see the Roles on the Interface guide.